Super Hero Boy: Thats one talented Dragon. Musical toys are always a favorite choice around here. Connor has been drawn to anything that makes anything that remotely sounds musical. When I saw the Dot the Musical Dragon over at Small World Toys I got pretty excited. First of all he is a dragon, and anyone that knows me or for those of you that have spotted the comments in earlier posts I am a dragon nut. 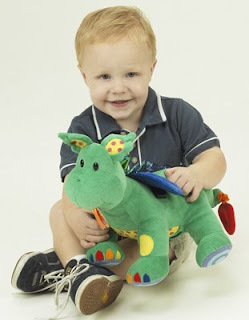 I'm still upset that there were no dragon crib sets available when Connor was little as believe me I looked for one. Dot encompasses two big loves around here, my love of dragons and Connor's love of music, he is just the sort of baby-toddler toy that I might have dreamed about. Dot is no ordinary dragon plush. Dot features many of the aspects that are so wonderful for babies and toddlers as he is firstly a tactile toy who hides a musical secret. Pretty ribbons near his mouth perfect for little fingers, beautiful little iridescent spikes and a set of wings that crinkle when touched, a loop on his tail that you pull and he vibrates, pretty patches of different colors, colored light up buttons on his back, and two modes of play. Lets not even go into the fact that I find him absolutely adorable. Dot has two modes of play the first of which is much more of an active play mode where the child can push the shaped buttons on his back and different music will play in short intervals as you press the buttons. For babies just starting to explore this is the perfect option. The second mode is a long play musical option, if you press one of the buttons the dragon will play all of its musical selections for quite some time. This is Connor's favorite option as he loves to dance to the music the only disadvantage is if you keep pressing buttons after the long play starts you could just keep it playing pretty much till the batteries run out if you wanted. One really super feature that parents will absolutely love is the fact that you can adjust the volume from high to low. We are starting to work on naming our colors and its nice that the buttons on Dot's back light up as it keeps Connor's attention so we can talk about what colors are lighting up as he presses them. Along with the colors the buttons are all different shapes, a square, triangle, heart and circle. Once we get our colors down pat we can work on the shapes too! Dot the Musical Dragon is available for purchase direction from Small World Toys! If you order over $100 worth of toys you can also count on free shipping as well! Oh that looks amazing! I'll keep it in mind! Evan would LOVE it!